Today I received the following message from a woman in Haarlem (a very lovely and old city near Amsterdam for which the Harlem of New York is named for). Her story is about her terrible experiences with an inexpensive family tricycle from the firm Faya4You in the Netherlands. 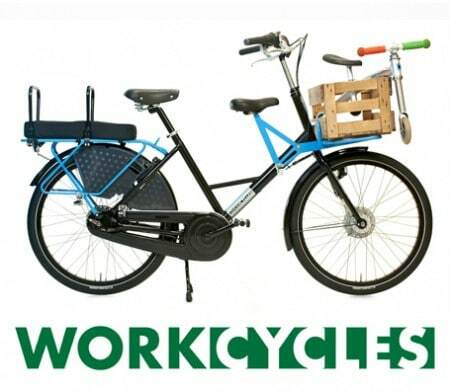 Its a “bakfiets” though not to be confused with the rather generically named “Bakfiets.nl” brand bikes we sell at WorkCycles. I was browsing your blog, and found it most interesting indeed. I thought based on what I have read there that I should share my recent experiences with you. I purchased a brand new bakfiets 1 1/2 years ago and have been through so much hell with it and the company who sold it to me that the Rijdende Rechter even wanted to cover it on the show, but the vendors wouldn’t participate so that came to nothing. I am not looking for help or advice; I just thought this story might interest you. I am a 39-year-old ex-American student with a 4-year-old. 1 1/2 years ago I realized that a bakfiets would be the solution to many of my transport problems, not having a car. I was able to use some of the money my family set aside after my great-aunt’s death for my education. That meant, however, that I needed to get an inexpensive bakfiets. Naively I thought that I should get a cheaper new one so that it would come with a guarantee. I bought a Faya4you. The Faya4you bakfiets is ostensibly delivered “rijklaar”. When it arrived, the delivery folks left without waiting for me to test ride it. I took it for a spin, and one of the first things I discovered was that the brakes did not work– at all. Luckily this came to light outside the home of my then neighbor, who is a bicycle repairman and sells used cycles. He put the brakes in order for me, saying they had not been installed correctly. The next thing that happened was that the wood, particle board, swelled up after a couple of rains and fell off! So I installed new wood. Thereafter, the left pedal and crank suddenly fell off. 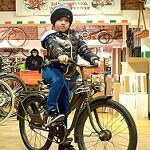 I took the trike to the Wolkenfietser, Haarlem’s excellent repair facility. They found that the axle had been twisted into a spiral, after only a couple of months of riding. I sent several e-mails to Faya4you (they normally do not answer the phone), and when I eventually mentioned legal action an axle suddenly arrived in the mail, with no other contact. I took it to the Wolkenfietser, where I was told that it was too short but that they would put it in and see how long that worked out. The answer was, about a week. So I bothered Faya4you again for a few weeks, this time with no response. By then I had come to depend on the bakfiets and was seriously inconvenienced by not being able to use it. So I gave up and bought a good axle, which was duly installed. A couple of months after that the gears stopped working. If I left it in 2 all was well, but if I ever switched it to 1, which happened frequently accidentally because of the placement of the release lever, it would freewheel for a while until I moved the lever back to 2, then make a horrendous “thunk” noise, then be in something VERY heavy for several revolutions, “thunk” again, and go back to 2. This was never repaired. Shortly after that the bakfiets started pulling to the right. It also started periodically making a sort of low-grade screaming noise from somewhere under the bak. Shortly after that, I was riding through traffic with my son in the bakfiets and it started feeling very weird: the back end seemed to sort of slide right out from under me every few seconds. I got off and looked, and part of the frame had snapped right in two. I took it to the Wolkenfietser and they said it was dead. I really, really needed the bakfiets and had less than no money so I took it to a smith, who welded a metal plate into that part of the frame. Over the next couple of months the bakfiets seemed to get heavier gradually. After a couple of months there started to be a swish, swish noise coming from the back. I could not get this noise to reproduce itself when I was in a position to be looking at the back end. Eventually though it started suddenly feeling like it was going through deep sand (it was still screaming, by the way, although that went away temporarily right after the weld). I was able finally to see that the back wheel was tilted sometimes. By the time I made it back to the Wolkenfietser the wheel was VERY tilted all the time. The fellow there started to check the spoke tension, and the spokes just started falling out. The upshot was that I needed a new wheel, due, they said, to the poor quality of the original wheel. This I got. 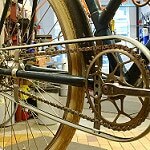 They advised me that the whole machine is of such poor quality and was so traumatized by the frame break and weld that they felt I should not try to get it repaired again if something else went wrong. It made it another few weeks. My son had started public school and in order to get him there without a bakfiets I need to walk 20 minutes and then get a bus, which runs at inconvenient times. I also have a serious back issue that made it difficult to do that. Anyway, during the last several weeks (about 12 weeks, I think) of its life, three things happened. First, the screaming increased and became accompanied by a numer of groans and squeaks and murmers. The front end developed a downright weird oscillation: when I started riding it would very slightly bounce up and down in front. This gradually increased until it was bouncing along joyously, then would stop when I stopped, and gradually build up again as I went forward. The third thing that happened was the pedals started rocking. If I was pedaling on the right the whole pedal assembly would rock over to the right, same thing on the left. Then last Monday the bakfiets just ground to a halt. I got off and looked, and part of the brake had come free and jammed itself between the wheel and the tire, shredding the inner tube. I managed to push it for half an hour, then my back gave out. And that is the end of it. I was in a panic but my father decided to buy me a second hand bakfiets, and it should arrive tomorrow. It is a Christiania Light, 5 years old, so I hope it will last for me. After the frame break I started sending e-mails and faxes to Faya4you without response. I sent two registered letters which were not picked up from the post office. I phoned continually from a variety of phones without answer. I sent the story to the Rijdende Rechter. After calling them twice the publicity lady for the show finally got a call back, and was told that Faya4you had done everything possible to help me and wanted nothing further to do with me. That same day a man called me and told me that he had received a lot of faxes that were not for him. I asked him what his number was and he did not want to tell me. I read him the Faya4you fax number and asked if it was his and he said that he did not know, then hesitated and then said no, it wasn’t. He would not provide an alternate number. And that is the end of that. I will have to sue them but right now I have 6 weeks left at school to get my degree and I have no money, so it will have to wait at least a little while. It seems to me I may have left an event or two out of this narrative, but you get the idea. The key events are here. Anyway, as I said I just thought you might be interested to hear about this incident and this company. The question of inexpensive family bikes comes up frequently and I often have venomous words about some of them, specifically because we hate hearing stories like the one above. Its an awful feeling to have to so sorely disappoint a customer by informing them that their nearly new bike is essentially irreparable. Five hundred euro might seem like a great deal in comparison to €1500 for a quality model and one might even accept shortcomings such as poor finish, lame lights, too few gears and somewhat higher maintenance as a reasonable tradeoff for the affordable purchase price. But the story below paints a very different picture: that of €500 initial cost plus probably much more in repair costs and time wasted on a bike that was nevertheless pronounced “dead” and worthless after 1.5 years. That doesn’t represent good value in my book nor was it an efficient use of world resources. Whether it’s responsible to sell such products from a safety perspective (specifically to carry children!) is an area I won’t even touch here. Just to note I’m just publishing this report for her and have no commercial interest in the matter whatsoever. I just find it a story worth telling because it effectively illustrates my conviction that quality products from a trusted source are worth paying for from every perspective: economics, safety, sustainability, enjoyment of life… Conversely, nasty, fly-by-night junk like this bike is of nothing but negative value for the world. If the people at Faya4You wish to respond (perhaps with a different version of the story) they are welcome to do so. The choice of a second-hand Christiania as replacement is excellent. If the bike looks OK after having been ridden five years it seems a safe bet that it’ll go another five or ten without any great problem. If fact, whenever possible with many purchases, second hand is the best bet for the budget, and for sustainability. The big challenge can be finding the right bike secondhand. 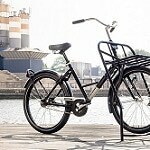 The demand for bakfietsen is growing so quickly in the Netherlands that it can be very difficult to find a decent one with appropriate specifications for a price that justifies buying second-hand. 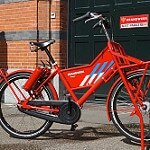 Bakfiets.nl Cargobikes, especially Long models, often sell for well over €1000 used. 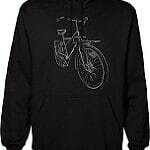 Same for bikes from Christiania, Fietsfabriek, ‘t Mannetje and Nihola. Its understandable then that most people will stretch for a new one with the latest upgrades, no hidden problems, in the color they want for a few hundred more. 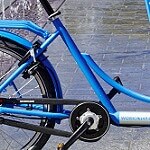 This entry was posted on Monday, December 8th, 2008 at 16:50	and is filed under Bikes in use, Product reviews and rants, Uncategorized. You can follow any responses to this entry through the RSS 2.0 feed.You can skip to the end and leave a response. Pinging is currently not allowed. As you know, I came really close to getting one of these cheap bikes. 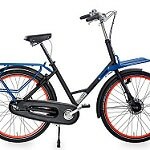 or for £1410 from Dutchbike. 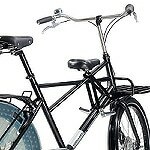 Only one of them is a Bakfiets.nl bike, but neither site mentions Bakfiets.nl or Azor. I suspect an unwary potential purchaser would think that £782 represented a bargain. 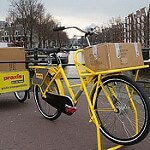 I completely agree about the generic-ness of the name “bakfiets.nl”… not helped much by the model name “Cargobike”. These stem from a much more naive time in bakfiets-world and now its inevitable that others will either capitalize on it by deliberately sowing confusion, or simply feel a need to use the word “bakfiets” or perhaps “cargo bike” to describe their products. That Azor manufactures Bakfiets.nl bikes isn’t a secret but also not something that needs to be advertised. 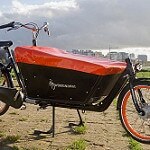 Maarten van Andel is the designer and owner of Bakfiets.nl and Azor the contractor who handles the materials. 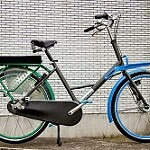 It is, for example, possible that other Bakfiets.nl products could be made by another firm. No, in case you’re wondering, I’m not suggesting there are actually plans to do so. 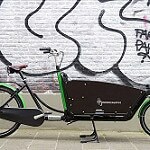 Selling that Chinese copy bakfiets (the one that goes under dozens of ever changing names here in Holland) for 782 GBP adn implying that its a quality piece of equipment is essentially criminal. But its legal and caveat emptor! We had another one of those bikes in the shop the other day. It was a few months old and again, almost every part on the bike was broken. The box had already rotted away and was gone. The customer’s main complaint was the “wobbly feeling” and that “scraping sound”… the broken frame was dragging on the ground. Are these Flying Pigeon manufactured bikes the same ones that were being sold as New Viper? I am guessing that there’s not multiple clones out there.. perhaps I am naive. Do you get these back in your shop too? Yes, what Joe refers to as the Flying Pigeon (though I’m not actually sure there’s any connection to Flying Pigeon) is the same bike as the “New Viper”. This is actually a different (though similar) bike than the Bakfietsweb / King / Bakfietsgigant / Pimmies / Tricycleweb et al bike. The Faya4you is also different, though that’s obvious since it has three wheels. 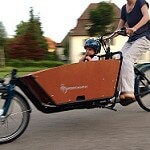 Halford’s also sells the “Boxbike” which is a copy of the Bakfiets.nl Cargotrike. 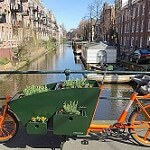 My name is Patrick, I was wondering if https://www.bakfiets-en-meer.nl was accepting contributor articles. I have a background in journalism and have an English degree from Central Michigan University. I am looking to expand my portfolio and I thought I would be a good match for your site. I am open to additional assignments and maybe even the chance to become a contributor. Also, are there any guidelines for me to check out?